The railroads of the United States are cut, tunneled, carved, and wrapped around the country’s vast and varied landscapes. These ribbons of steel were the first avenues that provided an unprecedented kind of connectivity, exploration, and communication through speed; from East to West, city to city, town to town, disparate places became spatially and temporally linked in the American Landscape. The connective arteries of the railroad made the American West a reality and created an inextricable link between the machine that was the railroad, the once remote landscape it opened to the world, and the people that it served. This confluence of the pre-industrial world and the penetrating machine was supplanted during the second half of the Twentieth century by new forms of rapid transit. Automobiles and highways, planes and landing strips completed the obliteration of a landscape of travel and altered the modalities of communication inherent to railroad travel. The synesthetic experience of nature and space retained by railroad travel was lost in a web of highways and the thin air of the troposphere. As alternative modes of transportation came to dominate, the railroad became characterized by abandonment. Ribbons of steel became streaks of rust. A concurrent history to the demise of the railroad is that of commercial printing, and its shift from handset type to mechanized linotype and eventually to digital printing. A nearly forgotten – perhaps even abandoned – point of convergence for the histories of the railroad and printing lies in the tramp printers of the late nineteenth and early twentieth centuries. During the days of handset type, itinerant printers traveled the country by freight train, strapped with their composing sticks and bedrolls, looking for work at newspapers and publishing houses as typesetters. The tramp printer was skilled craftsman whose traveling impetus was borne out of wanderlust and the age-old tradition of the journeyman. They traveled not only to fulfill a rambling personal desire, but also because their craft required the kind of experiential learning that may only be achieved through travel. These Shakespeare-quoting hobos followed the steel rivers of the country, facilitating the spread of the written word in their craft and spoken lore of their adventures. The railroads had simultaneously acted as a conduit for travel and knowledge, a circumstance that allowed for a unique kind of artistic and cultural production. In the parallel histories of tramp printers and the railroad transport and communication are inextricably linked, so can we use the modalities of the tramp printers to discover what is lost when a railroad is abandoned? And furthermore can we learn about the present landscape of travel and communication through the unique history of a railroad’s abandonment? And can we do this by occupying an abandoned space through reinvented forms of transportation and communication? 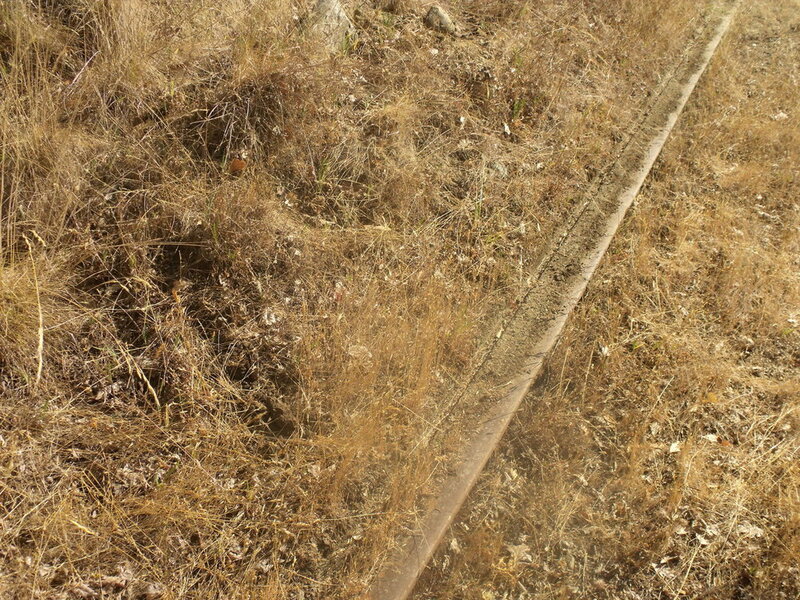 Our proposal is to situate ourselves in this lost landscape by traveling a series of abandoned train tracks in Northern California on rail-bikes with the aim of producing a primary document of our experience of the past and present states of the lines we travel. 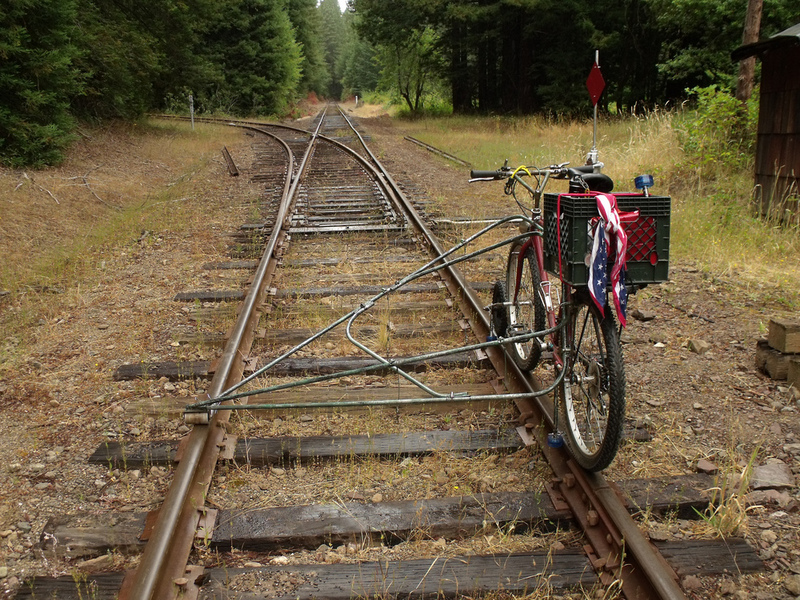 We have constructed two bicycles with attachments that allow them to run on abandoned railroad tracks. The rail-bikes are our way of producing an alternate mode of travel along these once-used lines. Our design involves a front wheel guide that clamps the bike onto one rail and an outrigger that provides balance. We believe that a first hand experience of the landscape, facilitated by these bicycles, is key to producing more than just a travel log of our journey. Our chosen mode of travel allows us to be immersed in the phenomenological relationship between travel and history, abandonment and what is lost when technology and tradition are rendered obsolete. Inspired by the legacy and tradition of the tramp printers we have restored a 3” by 5” Kelsey Excelsior hand operated letterpress that we will use to publish a chronicle of our travel in the forgotten right-of-way. We will send dispatches that will take many forms including prints, drawings, maps, and letters to a P.O. box in San Francisco, California to be collected upon our return. Similarly to the web of communication inherently produced by railroad transportation, our prints, drawings, maps, and letters will form story of abandoned railroads that expands out of our experience to disparate and varied audiences. The form of this production allows a variation in its use. By creating a range of documents we hope to create an archive with the ethos of printed matter as well as to build and write a story of these histories based in our own experience of a place. The specificity of the Northern Californian landscape we intend to explore is central to our investigation of more expansive notions of systematic abandonment. The History of Californian industry, spirit, and romanticism is one built on raw materials and production. The landscape of the State provided natural resources that sparked the engine of industry: from lumber and gold to almonds, oranges, and cattle. It is also the history of the relationship between remote natural landscapes and prosperous metropolitan centers. The ties and linkages between these two points were at one point solely railroad lines. The fact of a railroad’s abandonment poses a question to many aspects of this complicated interplay between remote locations and urban concourses. The decrease in freight traffic and abandonment of railroads is increasingly relevant within contemporary America, especially California, as a symptom of the effects of globalized industry and shifts in land-use. The objective of this project is explore what is lost once certain technologies are obsolete, as well as how a reinvention of those same technologies and occupation of a place can help us understand the state of present abandonment. Our inquiry is centered on a unique history of the railroads and printers that is tied to Northern California. For both of us, this project is an opportunity to work on a larger scale that can suspend a more multifaceted and complicated exploration of research and a complimentary artistic production than what we are normally capable of within the Cooper Union and New York City.